Researchers have created a new type of biosensor that can detect minute concentrations of glucose in saliva, tears and urine and might be manufactured at low cost because it does not require many processing steps to produce. "It's an inherently non-invasive way to estimate glucose content in the body," said Jonathan Claussen, a former Purdue University doctoral student and now a research scientist at the U.S. Naval Research Laboratory. "Because it can detect glucose in the saliva and tears, it's a platform that might eventually help to eliminate or reduce the frequency of using pinpricks for diabetes testing. We are proving its functionality." Claussen and Purdue doctoral student Anurag Kumar led the project, working with Timothy Fisher, a Purdue professor of mechanical engineering; D. Marshall Porterfield, a professor of agricultural and biological engineering; and other researchers at the university's Birck Nanotechnology Center. 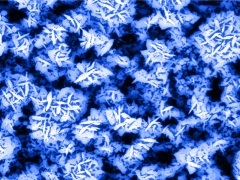 Findings are detailed in a research paper published in the journal Advanced Functional Materials. "Most sensors typically measure glucose in blood," Claussen said. "Many in the literature aren't able to detect glucose in tears and the saliva. What's unique is that we can sense in all four different human serums: the saliva, blood, tears and urine. And that hasn't been shown before." The paper, featured on the journal's cover, was written by Claussen, Kumar, Fisher, Porterfield and Purdue researchers David B. Jaroch, M. Haseeb Khawaja and Allison B. Hibbard. The sensor has three main parts: layers of nanosheets resembling tiny rose petals made of a material called graphene, which is a single-atom-thick film of carbon; platinum nanoparticles; and the enzyme glucose oxidase. Each petal contains a few layers of stacked graphene. The edges of the petals have dangling, incomplete chemical bonds, defects where platinum nanoparticles can attach. 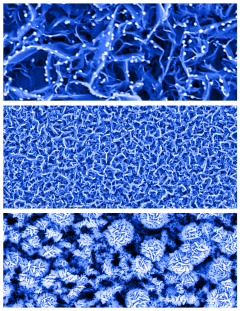 Electrodes are formed by combining the nanosheet petals and platinum nanoparticles. Then the glucose oxidase attaches to the platinum nanoparticles. The enzyme converts glucose to peroxide, which generates a signal on the electrode. "Typically, when you want to make a nanostructured biosensor you have to use a lot of processing steps before you reach the final biosensor product," Kumar said. "That involves lithography, chemical processing, etching and other steps. The good thing about these petals is that they can be grown on just about any surface, and we don't need to use any of these steps, so it could be ideal for commercialization." In addition to diabetes testing, the technology might be used for sensing a variety of chemical compounds to test for other medical conditions. "Because we used the enzyme glucose oxidase in this work, it's geared for diabetes," Claussen said. "But we could just swap out that enzyme with, for example, glutemate oxidase, to measure the neurotransmitter glutamate to test for Parkinson's and Alzheimer's, or ethanol oxidase to monitor alcohol levels for a breathalyzer. It's very versatile, fast and portable." "These are the first findings to report such a low sensing limit and, at the same time, such a wide sensing range," he said. Glucose by itself doesn't generate a signal but must first react with the enzyme glucose oxidase. Glucose oxidase is used in commercial diabetes test strips for conventional diabetes meters that measure glucose with a finger pinprick.